Thailand’s Property Report profiled me on the subject of smart cities in Asia. To their credit, they don’t attempt to whitewash the inherent flaws in so-called smart cities and give more than a fair hearing to my own ideas of what a smart city should be. I’ve republished the piece below. Humankind will make the great crossing from the countryside to urban centres in coming decades. Many will consider themselves lucky to make the move to a so-called smart city. The notion of living in smart cities has jumped from the drawing board to reality over the last few years. Urban planners are excited about the prospect of urbanites becoming more interconnected than they already are, living in communities packed with sensors and set aside as test labs for the Internet of Everything while digitisation streamlines the very way they lead lives. Smart cities trigger complex discussions fraught with a myriad of issues ranging from infrastructure to inclusivity. No one could pin down what exactly a smart city is, partly because the concept is so open to interpretation — and because it essentially does not exist yet. The need for one hangs in the air. As metropolises bloat with over-populace, spewing carbon into the atmosphere and suffering from vestigial inefficiencies of the last century, urban planners and technocrats have agreed that redefining the very fabric of a city is of the essence. As leader of the nonprofit’s Connected Mobility Initiative, Lindsay has borne witness to the rise and fall of smart city initiatives around the world. In his 2011 book Aerotropolis: The Way We’ll Live Next, Lindsay studied the critical intersections between smart infrastructure and smart cities. Early on, the city of Songdo in South Korea testified to the transformative effects an airport could have on adjacent areas. Built on a 600-hectare reclaimed land parcel outside Seoul, Songdo thrived on its direct link, by way of a seven-mile bridge, to Incheon International Airport, in the same way outlying islands in Hong Kong benefited from the USD20-billion transfer of its old airport in the 2000s. Lindsay has followed the plight of Songdo in its ultimately disappointing bid to become the world’s first smart city. “The general perception of Songdo after an incredible hype cycle has now descended down into this trough of disillusionment,” he said. 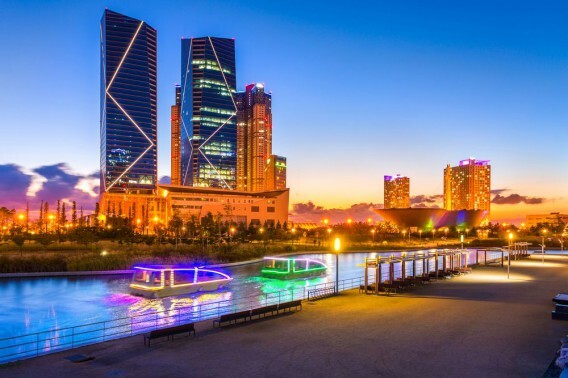 Songdo has failed to measure up to the titanic expectations of being “first.” The USD-40 billion project has made a comfortable home for as many as 100,000, but the figure represents less than half of its capacity, and many of the heralded smarts have yet to pass. Still, it is likely that a real smart city will burst forth in Asia first, on the rock-solid foundation of an existing, evolving city. Singapore, in Lindsay’s opinion, seems to be leading the way, raising the bar when it comes to giving citizens opportunities to engage directly with government. As does Dubai: housing authorities in the emirate made headlines late last year when they announced lavish investments in blockchain technology, cryptocurrency payments, and drone technology. While all these advancements tickle futurists, the ‘holy grail’ of smart cities would be to be able to distribute planning decisions to each and every citizen, Lindsay explained. This then raises the question as to whether smart cities can ever be inclusive by their very nature. Critics of the movement lament that smart cities only benefit certain segments of the body politic; somebody somewhere is always left behind in the race toward becoming Smart. The fundamentals of smartening an existing city sooner or later require investing in leading-edge technology, an act anathema to poorer economies. Smart technology, in many ways, is designed to dovetail easily with societies that have reached higher rungs of advancement and connectivity. Before applying smart tech at the grassroots level, an urban planner must engage first with the social context of a city and understand issues endemic to it. 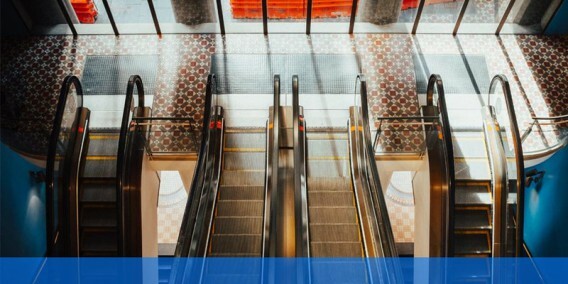 Alongside governments, property developers must be aware of their mandate to leverage technology and refine experiences for people in their localities. “It’s just a question of how do you layer value and add new uses on top of the already great places we’re developing,” said Lindsay. Smart cities may have that rarefied feel with thorny barriers to entry but in 2016, the world gained a glimpse of the infinite possibilities the majority could have in a smart city. Pokemon Go, a gaming app which conflates the popular ’90s cartoon characters with the ultra-modern trappings of augmented reality, exploded across mobile screens worldwide. It gave people a simulacrum of connectivity that cuts across multiple tiers of the economic situation. So what will cities of the future look like? They will not spring out of nowhere like Songdo for certain, he suggested. “The cities that we have and that we know and love are the result of decades, centuries, thousands of years of many, many hands building and rebuilding spaces that people love at a visceral level. I’m excited to announce I’ve been invited to curate reSITE 2018 in Prague on June 14-15. If you’re not familiar with reSITE, it’s a non-profit series of events devoted to the future of cities, whose tentpole conference in Prague attracts more than a thousand participants from around the world. I had the pleasure of speaking at both the 2013 and 2015 editions (pictured above), where recent themes have included the “shared city,” infrastructure, and the global refugee crisis. Is it time to reconsider what a better city looks like? The tide has clearly lifted all boats over the last two decades of urban development, yet gentrification, rising costs of living and inequality pose considerable challenges for city leaders, investors, planners and architects to design a city that works for everyone. “I’m honored to join reSITE as guest curator after having had the pleasure of watching it evolve as a speaker and attendee since 2013. I’m also humbled to tackle the biggest issue cities face: where and how people live, and how to do it fairly, equitably, and sustainably. The right to the city begins with housing, and so that’s where the theme of reSITE 2018 begins,” explains the new program curator of the event Greg Lindsay, a writer, journalist and urbanist. What happens when you convene 25 architects, designers, public policy experts, aides to both the Mayor of New York and the Governor of New York, and futurists with the brief to imagine a world of autonomous stuff and not just cars? 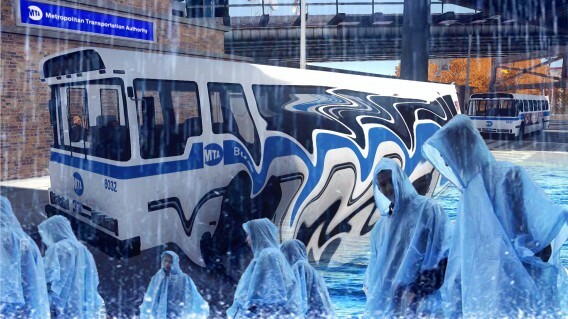 You get five strange and exhilarating scenarios ranging from autonomous libraries to an anonymous ride-hailing service for undocumented migrants living and working in the suburbs to the winning entry (as judged by an audience of more than 100+ attendees): “Liquid Transit,” a wholly dynamic bus network first deployed in the wake of a Hurricane Sandy-style disaster. The workshop was organized by Dash Marshall’s Brian Boyer, who invited me to a similar workshop last year run on behalf of Bloomberg Philanthropies and the Aspen Institute. (That installment was co-organized by Bits and Atoms’ Anthony Townsend, who wasn’t present this time around.) A partial roster of all-star attendees included Women-Led Cities’ Katrina Johnston-Zimmerman, Gensler’s Richard Tyson, Intersection’s Jeff Maki, Project for Public Spaces’ Ethan Kent, Arup’s Francesca Birks, the Regional Plan Association’s Manu Sen, and many more. If there’s one lesson to draw from the exercise, it’s that the central premise of autonomy — that it will be used to move people from point A to point B, usually in cars — is fundamentally wrong. Throughout multiple rounds of brainstorming and discussion, participants kept coming back to the idea of autonomy being applied to resources and institutions as a stopgap to help deal with failing pubic services. Instead of autonomous cars, we talked about autonomous hospitals or medical clinics deployed to communities whose residents used it to treat themselves. We discussed how shadow transportation networks might arise in response to pervasive surveillance and persecution, and how those networks might steer people toward communities and resources. And we talked about everything except the technology. 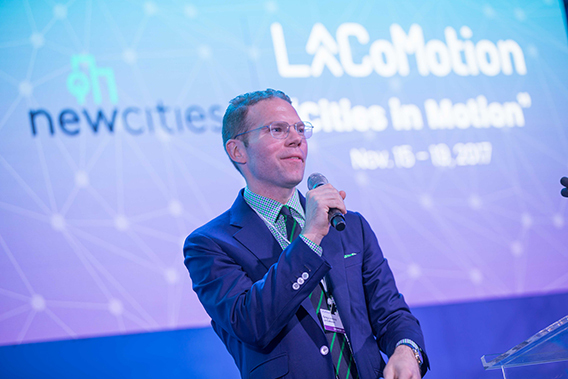 The Augmented City podcast’s John du Pre Gauntt sat down with me in November to recap the inaugural edition of LA CoMotion. (Note: we both sound utterly exhausted after four exhilarating days.) Please click through to give it a listen. And get ready: LA CoMotion will return to the Arts District of Los Angeles on Nov. 15-18. See you there. 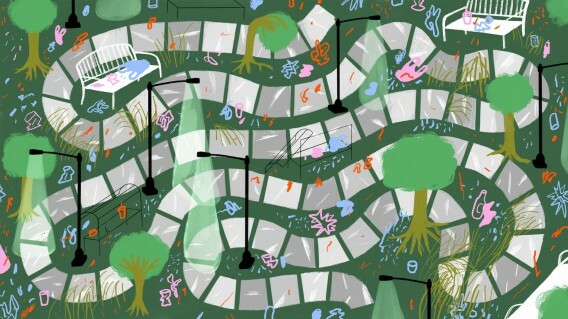 For 75 years, visions of autonomous urban systems have revolved around the self-driving car. 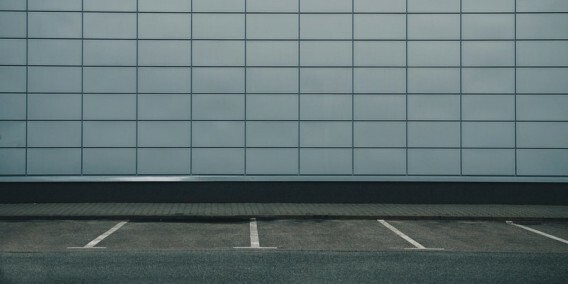 But while AVs remain just over the commercially available horizon, autonomous stuff is already here: delivery bots on the sidewalks of London and San Francisco, a self-driving convenience store in Shanghai, and drones delivering blood to Swiss hospitals. Anthony Townsend, Bryan Boyer and Greg Lindsay will host an interactive debate where provocative scenarios will be discussed, voted and proposed. This event will come after an afternoon closed-doors workshop with experts across disciplines including urban planning, technology, policy, and real estate, who will also be participating in this session. How can autonomous systems help solve existing challenges for cities, rather than provide solutions to non-existent problems? Join the discussion. In lieu of a year-in-review, here’s a brief clip from last month’s LA CoMotion highlighting its “Street of the Future,” which I helped develop. Here’s to a restful holidays and renewed sense of purpose in 2018! See you on the other side. I speak frequently about the future of cities, work, mobility, and occasionally the future of the future itself. Past engagements and events include the 14th Venice Architecture Biennale, the Aspen Ideas Festival, the Clinton Global Initiative, and the World Economic Forum. I speak frequently to companies (McKinsey, Microsoft, Intel, KPMG, Deloitte, AECOM, RE/MAX, BMW MINI, Ford, Starbucks), organizations (the OECD, U.S. State Department, U.S. Department of Energy, U.K. Treasury, Canada Council for the Arts), member associations (CoreNet, Urban Land Institute, National Association of Home Builders, Federation Internationale de l’Automobile) and universities (Harvard Business School, the MIT Media Lab, Columbia, Princeton, the Royal College of Art, the London School of Economics). Below is the current list of past and future appearances, always bound to change. If you’re interested in helping to arrange a speaking appearance, please send me an email. A complete list of speaking topics can be found at Speakers Spotlight. November 14-15, 2019. Los Angeles, CA. June 11, 2019. London, UK. June 9, 2019. Jackson Hole, WY. June 6-7, 2019. New York, NY. May 15, 2019. New York, NY. May 9, 2019. Dallas, TX. May 1-2, 2019. Abu Dhabi, UAE. April 23, 2019. West Point, NY. April 15, 2019. Tampa, FL. April 13, 2019. Washington, D.C.
April 10, 2019. Carlsbad, CA. April 3, 2019. New York, NY. Designing Our Future New York. March 25, 2019. Denver, CO.
March 16, 2019. New York, NY. February 24-25, 2019. Abu Dhabi, UAE. February 22, 2019. Scottsdale, AZ. February 21, 2019. Las Vegas, NV. February 19, 2019. Brooklyn, NY. ReversaL: A Public Forum on The Partial Shutdown of The L-Train. January 31, 2019. Richmond, CA. January 22, 2019. Carlsbad, CA. January 11, 2019. West Point, NY. November 29, 2018. New York, NY. November 27, 2018. New York, NY. November 14-17, 2018. Los Angeles, CA. November 13, 2018. Los Angeles, CA. November 6, 2018. Los Angeles, CA. October 22-24, 2018. Nashville, TN. October 16, 2018. Jacksonville, FL. October 9, 2018. New York, NY. October 4, 2018. Nashville, TN. October 3, 2018. Dayton, OH. October 1, 2018. Detroit, MI. September 27, 2018. New, York, NY. September 26, 2018. Montreal, QC. September 25, 2018. New York, NY. September 17, 2018. Boston, MA. September 17, 2018. Cambridge, MA. September 14, 2018. Tampa, FL. September 13, 2018. Tampa, FL. September 11, 2018. San Francisco, CA. June 14-15, 2018. Prague, Czech Republic. June 12, 2018. Berlin, Germany. June 4, 2018. New York, NY. May 31, 2018. Riga, Latvia. May 24, 2018. Albuquerque, NM. Urban Land Institute New Mexico. May 17, 2018. New York, NY. May 14, 2018. New York, NY. Onward: Mobility in the Next New York. May 10, 2018. New York, NY. MSCI U.S. Real Estate Investment Conference. May 9, 2018. New York, NY. May 3, 2018. New York, NY. NAIOP National Forums Symposium 2018. April 26, 2018. London, United Kingdom. April 19, 2018. Toronto, ON. CIBC 23rd Annual Real Estate Conference. March 27, 2018. New York, NY. March 22, 2018. Victoria, BC. March 19-21, 2018. Auckland, New Zealand. March 14, 2018. Chicago, IL. March 12, 2018. Boston, MA. February 1, 2018. Los Angeles, CA. January 31, 2018. New York, NY. BMW iVentures Urban Mobility Forum. January 28, 2018. San Antonio, TX. American Traffic Safety Services Association. January 27, 2018. New York, NY. City of Tomorrow Real Estate, Architecture, and Design Summit. January 25, 2018. Orlando, FL. January 23, 2018. New York, NY. Where the Robot Meets the Road: Autonomous Everything. January 9, 2018. Orlando, FL. December 18, 2017. Cambridge, MA. December 7, 2017. Durham, NC. CREO North Carolina General Meeting. December 6, 2017. New York, NY. Mixed-Up Use: Toward More Diverse Real Estate. December 6, 2017. Saratoga Springs, NY. Associated General Contractors of NYS. November 30, 2017. New York, NY. November 15-19, 2017. Los Angeles, CA. November 7, 2017. New York, NY. November 2-3, 2017. Los Angeles, CA. November 1, 2017. San Antonio, TX. October 24-25, 2017. New York, NY. October 17, 2017. Albany, NY. October 11, 2017. New York, NY. October 10, 2017. New York, NY. September 28, 2017. Chicago, IL. September 26, 2017. New York, NY. September 19, 2017. Victoria, BC. Platform: A Retreat for Design Visionaries. September 18, 2017. Denver, CO.
September 14, 2017. Columbus, OH. September 13, 2017. New York, NY. September 8, 2017. Kelowna, BC. Investment Industry Regulatory Organization of Canada. August 23, 2017. Albuquerque, NM. August 22, 2017. Colorado Springs, CO.
August 17, 2017. San Francisco, CA. August 16, 2017. San Francisco, CA. July 20, 2017. Los Angeles, CA. July 13, 2017. Milford, CT.
June 29, 2017. Bangkok, Thailand. June 22, 2017. Montreal, QC. June 12, 2017. New York, NY. June 8-9, 2017. Incheon, Republic of Korea. June 5, 2017. New York, NY. June 1, 2017. Montreal, QC. May 13, 2017. Brooklyn, NY. May 12, 2017. New York, NY. May 5, 2017. New York, NY. May 4, 2017. New York, NY. May 3, 2017. Brooklyn, NY. April 19, 2017. Toulouse, France. April 5, 2017. New York, NY. Bloomberg Aspen Initiative on Cities and Autonomous Vehicles. April 3, 2017. Brooklyn, NY. March 30, 2017. Brooklyn, NY. March 29, 2017. Oslo, Norway. March 7, 2017. Fort Lauderdale, FL. March 6, 2017. Dallas, TX. February 24, 2017. San Diego, CA. February 22, 2017. Chicago, IL. IC Bus Next Stop Innovation Summit. February 17, 2017. Hollywood, FL. February 13, 2017. Brooklyn, NY. January 27, 2017. Brooklyn, NY. January 17, 2017. Abu Dhabi, United Arab Emirates. January 10, 2017. Los Angeles, CA. AECOM Urban SOS: Fair Share. December 13, 2016. New Orleans, LA. November 22, 2016. Bordeaux, France. November 15, 2016. Dallas, TX. November 4, 2016. Tokyo, Japan. November 1, 2016. New York, NY. October 26, 2016. Cambridge, MA. October 20-21, 2016. Tokyo, Japan. World Economic Forum Young Global Leaders Summit. October 18, 2016. Los Angeles, CA. October 14, 2016. Miami Beach, FL. October 12, 2016. San Antonio, TX. September 27, 2016. Amsterdam, the Netherlands. September 21-22, 2016. Ann Arbor, MI. September 20, 2016. London, United Kingdom. September 19, 2016. Atlanta, GA.
September 16, 2016. Holland, MI. September 15, 2016. Irvine, CA. July 13, 2016. Boston, MA. June 21-22, 2016. Montreal, QC. June 17, 2016. New York, NY. Columbia GSAPP Durst Conference 2016. June 15, 2016. New York, NY. Urban Design Forum: New Ideas for Urban Freight. June 10, 2016. Brussels, Belgium. June 7, 2016. Trenton, NJ. May 26, 2016. New York, NY. May 18-20, 2016. Leipzig, Germany. May 11, 2016. Providence, RI. Providence Committee on Foreign Relations. May 10, 2016. Indian Wells, CA. April 28, 2016. San Francisco, CA. April 26, 2016. Strasbourg, France. April 12, 2016. New York, NY. April 4, 2016. San Antonio, TX. March 31, 2016. Washington D.C..
Brent Scowcroft Center on International Security. March 24, 2016. New York, NY. March 23, 2016. New York, NY. March 7, 2016. Newport Beach, CA. American Automotive and Leasing Association. March 4, 2016. Manila, the Philippines. March 2, 2016. Manila, the Philippines. February 11, 2016. London, United Kingdom. February 10, 2016. London, United Kingdom. February 9, 2016. London, United Kingdom. January 22, 2016. New York, NY. December 8-9, 2015. King Abdullah Economic City, Saudi Arabia. November 21-22, 2015. Dubai, United Arab Emirates. November 18, 2015. Pasadena, CA. November 17, 2015. New York, NY. November 12-13, 2015. Cambridge, MA. November 10, 2015. Zurich, Switzerland. November 9, 2015. Paris, France. October 27-28, 2015. Eden Prairie, MN. October 22, 2015. New York, NY. October 14, 2015. London, United Kingdom. October 7, 2015. New York, NY. September 30, 2015. York Regional Municipality, ON. September 28, 2015. Playa del Carmen, Mexico. September 22, 2015. San Antonio, TX. September 16, 2015. London, United Kingdom. September 14, 2015. Nashville, TN. Automotive Fleet & Leasing Association. September 4, 2015. Los Angeles, CA. June 18-19, 2015. Prague, Czech Republic. June 9-11, 2015. Jakarta, Indonesia. June 2, 2015. New York, NY. The Happiness Industry: Book Discussion with Will Davies, Greg Lindsay, and Melissa Aronczyk. May 28, 2015. Bursa, Turkey. Bursa Innovation and Design Summit. May 20, 2015. Seattle, WA. May 19, 2015. Redmond, WA. May 15, 2015. Dubai, United Arab Emirates. May 6, 2015. Orlando, FL. University of Central Florida Real Estate Conference. May 5, 2015. Miami, FL. March 12, 2015. Cambridge, MA. February 20, 2015. Washington, DC. February 19, 2015. Fort Worth, TX. February 12, 2015. Orlando, FL. Association of Energy Services Professionals. January 30, 2015. San Francisco, CA. January 27, 2015. Berkeley, CA. December 11, 2014. Minneapolis, MN. Made in Minnesota: Celebrating university innovators. December 9, 2014. New York, NY. Influx and Exodus: Two Conversations on Urban Density. December 3, 2014. New York, NY. Re-Programming Mobility: What Do Smart Phones and Self-Driving Cars Mean for Future Cities? December 2, 2014. Cambridge, MA. November 24, 2014. New York, NY. November 19-21, 2014. Santa Fe, NM. “Acting Locally, Understanding Globally.” Santa Fe Institute. November 12, 2014. New York, NY. Urban Salon: NYC Transportation in 2030. November 11, 2014. London, United Kingdom. November 10, 2014. London, United Kingdom. October 23, 2014. New York, NY. October 22, 2014. Brooklyn, NY. October 10, 2014. Ottawa, ON. October 9, 2014. Baltimore, MD. September 28-30, 2014. Los Angeles, CA. September 22-23, 2014. Toronto, ON. September 16, 2014. Detroit, MI. July 28, 2014. Los Angeles, CA. July 14, 2014. New York, NY. June 27-30, 2014. Aspen, CO.
June 23-25, 2014. Denver, CO.
June 20, 2014. Amsterdam, the Netherlands. June 19, 2014. Dallas, TX. June 18, 2014. Mississauga, ON. June 17, 2014. Dallas, TX. June 16, 2014. Dallas, TX. June 10, 2014. Chicago, IL. June 4, 2014. Venice, Italy. STREAM Lectures at the Venice Architecture Biennale. June 2, 2014. Montreal, QC. May 21, 2014. New York, NY. May 20, 2014. Seattle, WA. May 16, 2014. Angeles City, Philippines. May 13, 2014. Manila, Philippines. The American Chamber of Commerce of the Philippines. May 8, 2014. Sao Paulo, Brazil. April 25, 2014. Chicago, IL. April 22, 2014. New York, NY. April 11, 2014. New York, NY. Mobilities in Cities: From Visible to Invisible. April 9, 2014. Toronto, ON. April 1, 2014. New York, NY. Extrastatecraft: A Salon with Keller Easterling. March 22, 2014. New Orleans, LA. March 10, 2014. New York, NY. “Youth Think Tank: The Next Big Ideas from the Next Generation,” 92nd St. Y. March 6, 2014. Mountain View, CA. February 27, 2014. New York, NY. Smart Law for Smart Cities. February 14, 2013. Los Angeles, CA. January 30, 2014. New York, NY. “When Computers Take Over The City,” World Policy Institute. January 16, 2014. Garden City, NY. Build a Better Burb: ParkingPLUS Design Challenge. January 14, 2014. Calgary, AB. December 10, 2013. Washington, DC. Atlantic Council 2013 Strategic Foresight Forum. November 25-26, 2013. King Abdullah Economic City, Saudi Arabia. November 20, 2013. London, United Kingdom. November 18-19, 2013. Miami, FL. November 3, 2013. Baltimore, MD. Boyd Group International Aviation Forecast Summit. November 1, 2013. New York, NY. October 22, 2013. Las Vegas, NV. October 12, 2013. New York, NY. NYU Drones & Aerial Robotics Conference. October 3, 2013. Buenos Aires, Argentina. September 27, 2013. Reno, NV. September 26, 2013. Sydney, Australia. September 23, 2013. Niagara Falls, ON. September 19, 2013. Atlanta, GA.
September 17, 2013. Bolingbrook, IL. August 20, 2013. New York, NY. Tech Tuesdays at the Seaport: Five Ideas To Change The City. July 18, 2013. New York, NY. World Policy Institute Political Salon. July 11, 2013. New York, NY. June 28, 2013. Los Angeles, CA. June 21, 2013. Prague, Czech Republic. June 20, 2013. Istanbul, Turkey. June 19, 2013. London, United Kingdom. Urban Land Institute Europe Trends Conference. June 18, 2013. Amsterdam, the Netherlands. June 11, 2013. Los Angeles, CA. June 4-5, 2013. Sao Paulo, Brazil. May 22, 2013. Los Angeles, CA. Extreme IDEAS: Architecture at the Intersection. May 16, 2013. New York, NY. May 15, 2013. Atlanta, GA.
May 13, 2013. New York, NY. “Which Cities Will Survive the 21st Century?” New America Foundation. May 7, 2013. Rapid City, SD. Rapid City Chamber of Commerce. May 2, 2013. New York, NY. World Policy Institute: Around the Table. April 22-23, 2013. New York, NY. Assocation of Corporate Travel Executives. April 17-19, 2013. Tempe, AZ. “Urbanization, Sustainability, Resilience, and Prosperity” Workshop, Arizona State University. April 1, 2013. New York, NY. March 20, 2013. Ontario, CA. State of the City 2013. March 11, 2013. Boston, MA. February 21, 2013. Angeles City, Philippines. February 20, 2013. Manila, Philippines. December 6, 2012. London, United Kingdom. London School of Economics: Urban Age. November 20, 2012. Princeton, NJ. November 15, 2012. Barcelona, Spain. Smart City Expo World Congress 2012. November 7, 2012. Menlo Park, CA. The Institute for the Future 2012 Technology Horizons Conference. November 1, 2012. Boston, MA. The Boston Society of Architects. October 13, 2012. Brooklyn, NY. October 12, 2012. New York, NY. Columbia University: The Global Street. September 25, 2012. New York, NY. September 19, 2012. Moncton, NB. The 2012 Air Cargo Logistics Symposium. September 2, 2012. Salzburg, Austria. July 26, 2012. Los Angeles, CA. June 4, 2012. New York, NY. May 21, 2012. Haifa, Israel. May 15, 2012. Kansas City, MO. May 11, 2012. New York, NY. Fordham University Smart City Symposium. Open to all. RSVP required. May 3, 2012. New York, NY. World Policy Institute 50th Anniversary and Celebration. May 1, 2012. Seattle, WA. April 27, 2012. New York, NY. April 23, 2012. New York, NY. World Policy Institute & Columbia University School of International and Public Affairs. “The Future of the City.” 6:30 PM. April 19, 2012. New York, NY. Studio-X X-Cities 4, featuring Living PlanIT and Songdo IBD. Free and open to all. April 18, 2012. St. Petersburg, FL. April 10, 2012. New York, NY. Studio-X X-Cities 3, featuring IBM’s Guru Banavar. Free and open to all. April 5, 2012. Hillsboro, OR. Intel Labs 2012 Trendspotting Summit. March 29, 2012. Albuquerque, NM. March 28, 2012. Albuquerque, NM. Bookworks. Discussion and signing. Free and open to the public. March 20, 2012. New York, NY. Studio-X X-Cities 2. Free and open to all. March 14, 2012. New York, NY. School of the Visual Arts. March 12, 2012. Muscat, Oman. March 11, 2012. Dubai, United Arab Emirates. Middle East Facilities Management Association. March 9, 2012. Providence, RI. Brown University Urban Affairs conference. February 21, 2012. New York, NY. Studio-X X-Cities series. Free and open to all. February 15, 2012. Washington, DC. February 14, 2012. New York, NY. Foreclosed: Rehousing the American Dream. Exhibition at the Museum of Modern Art. January 24, 2012. Seattle, WA. November 14, 2011. New York, NY. November 10, 2011. New York, NY. November 7, 2011. Montreal, QC. The Association of Corporate Travel Executives. October 31-November 1, 2011. London, United Kingdom. October 20, 2011. New York, NY. Asia Society New York. Registration required. Open to all. October 14, 2011. Phoenix, AZ. October 13, 2011. Ottawa, ON. Columbia University, Committee for Global Thought. October 4, 2011. Destin, FL. The National Building Museum. 6:30 PM. Reading and discussion. Admission required; open to all. Columbia University, Graduate School of Architecture, Planning and Preservation. Brooklyn Book Festival. 4 PM at Brooklyn Historical Society Library. Free and open to all. September 17, 2011. Queens, NY. “Foreclosed” Open Studios. 12-6 PM at MoMA PS1. Open to the public. September 15, 2011. Champaign, IL. TEDxUIllinois. Free; visit the site to request an invitation. September 3-4, 2011. Decatur, GA. The AJC Decatur Book Festival. Open to the public. August 29-30, 2011. Sao Paulo, Brazil. The Clinton Global Initiative: CGI America. June 18, 2011. Queens, NY. “Foreclosed” workshop presentations. 2 PM at MoMA PS1. Open to the public. June 7, 2011. New York, NY. The New York Public Library. 6:30 PM. Discussion and signing. Free and open to all. June 6, 2011. Washington D.C.
May 23, 2011. Dubai, United Arab Emirates. May 11, 2011. Denver, CO.
May 10, 2011. Denver, CO. Tattered Cover Book Store. 7 PM. Reading and discussion. Free and open to all. May 7, 2011. New York, NY. Pecha Kucha #11, “The Dimensions of a New City.” 11:29 PM at the Old School Gym, 268 Mulberry Street. May 7, 2011. Queens, NY. “Foreclosed” preliminary presentations. 2 PM at MoMA PS1. Open to the public. May 2, 2011. Chicago, IL. April 28, 2011. New York, NY. April 20, 2011. New York, NY. Talking Books with the Architectural League of New York. McNally Jackson Bookstore, 7 PM. Free and open to all. April 14, 2011. Brooklyn, NY. The Futurist and Kite Flying Society of Galapagos Art Space. 7 PM. Registration required. Open to all. April 13, 2011. Memphis, TN. April 12-13, 2011. Memphis, TN. April 11, 2011. Memphis, TN. Davis-Kidd Booksellers. 6 PM. Free and open to all. April 8, 2011. New York, NY. April 5, 2011. Los Angeles, CA. April 4, 2011. San Francisco, CA. World Affairs Council of Northern California. April 1, 2011. Berkeley, CA. University of California Architecture Research Colloquium. March 31, 2011. Portland, OR. March 30, 2011. Seattle, WA. March 29, 2011. Irving, TX. The World Affairs Council of Dallas/Fort Worth and The Greater Irving-Las Colinas Chamber of Commerce. March 24, 2011. Kankakee, IL. March 23, 2011. Chicago, IL. March 22, 2011. Chicago, IL. The Chicago Council of Global Affairs. March 21, 2011. Cambridge, MA. March 20, 2011. New York NY. March 16, 2011. Atlanta, GA.
March 11, 2011. Louisville, KY.
February 23-24, 2011. San Francisco, CA. Global Green Cities of the 21st Century. October 18, 2010. Shanghai, China. October 1, 2010. New York, NY. “Cities and Eco-Crises,” Columbia University. August 25-28, 2010. Sao Paulo, Brazil. August 2, 2010. San Carlos, CA. June 9-10, 2010. Las Vegas, NV. April 21-23, 2010. Beijing, China. April 1, 2010. Champaign, IL. September 15, 2009. Atlanta, GA.
April 28-29, 2009. Taipei, Taiwan. Earlier this month, I was delighted to attend “Aerial Futures: Leading Edge,” the second symposia about the future of airports and cities organized by the Berlin-based agency PLANE-SITE. In addition to joining a behind-the-scenes tour of LAX and imagining how airports of the future might function, I was honored to moderate a discussion about airports-as-public-spaces featuring the Los Angeles Times’ architecture critic Christopher Hawthorne, architect Curtis Fentress (of Denver International fame), Project for Public Space’s Cynthia Nikitin, and aviation consultant Andrew Vasey. A brief video recap is above. The urban mix has become mixed-up as retailers fear extinction at the hands of Amazon, hotels are being redesigned to feel like living rooms — or are living rooms courtesy of AirBnB — while knowledge workers are setting up shop in coworking spaces, restaurants and public places — anywhere but the office. What does it mean for cities when old paradigms such as the office tower, department store, factory, and park fall by the wayside or blur together? What are the opportunities and challenges when pop-ups proliferate because no one can meet the landlords’ asking price? When cafes prove more appealing than cubicles, and parks are more than the sum of their playgrounds? 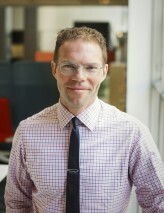 Moderated by Greg Lindsay, writer, futurist and Urbanist-in-Residence at URBAN-X.